Shariatmadar, F., Ghanbari Pakdehi, S., Zarei, M. (2016). An Empirical Correlation to Predict the Ignition Delay Time for Some Hydrocarbon Fuels. Iranian Journal of Chemical Engineering(IJChE), 13(1), 84-97. F. S. Shariatmadar; Sh. Ghanbari Pakdehi; M. A. Zarei. "An Empirical Correlation to Predict the Ignition Delay Time for Some Hydrocarbon Fuels". 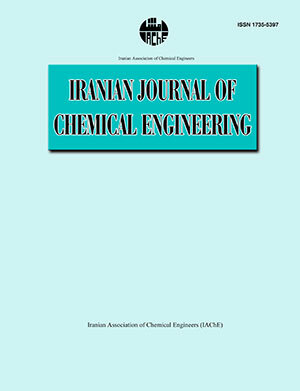 Iranian Journal of Chemical Engineering(IJChE), 13, 1, 2016, 84-97. Shariatmadar, F., Ghanbari Pakdehi, S., Zarei, M. (2016). 'An Empirical Correlation to Predict the Ignition Delay Time for Some Hydrocarbon Fuels', Iranian Journal of Chemical Engineering(IJChE), 13(1), pp. 84-97. Shariatmadar, F., Ghanbari Pakdehi, S., Zarei, M. An Empirical Correlation to Predict the Ignition Delay Time for Some Hydrocarbon Fuels. Iranian Journal of Chemical Engineering(IJChE), 2016; 13(1): 84-97. Examination of the available ignition delay time data and correlations in the case of methane, butane, heptane, decane, kerosene, Jet-A and ethylene fuels, allowed the derivation and recommendation of standard equations for this property. In this study, a new accurate substance dependent equation for ignition delay time as a function of pressure, number of carbon atoms, mixture equivalence ratio, fuel mole fraction and temperature has been developed to estimate ignition delay time of some hydrocarbon fuels. With the presented model, ignition delay time has been calculated and compared with the data reported in literature. The accuracy of the obtained model has been compared to the mostly used predictive models and the comparison indicated that the proposed correlation provides more accurate results than other models used in the previous works. Irwin, R. E. A study of the spontaneous ignition delay of hot lean mixtures of gaseous hydrocarbon fuels and air in a flowsystem, MSc Thesis, McGill University, Montreal, (1957). Horning, D. A study of the high-temperature autoignition and thermal decomposition of hydrocarbons, Report No. TSD-135, (2001). Colket, M. B. and Spadaccini, L. J., "Scramjet fuels autoignition study", J. Propul. Power., 17 (2), 315 (2001). Davidson, D. F. and Hanson, R. K., "Interpreting shock tube ignition data", Int. J. Chem. Kinet., 36 (9), 510 (2004). Horning, D. C. Davidson, D. F. and Hanson, R. K., "Study of the high-temperature autoignition of n-alkane/O2/Ar mixtures", J. Propul. Power, 18 (2), 363 (2002). Imbert, B. Lafosse, F. Catoire, L. Paillard, C. E. and Khasainov, B., "Formulation reproducing the ignition delays simulated by a detailed mechanism: Application to n-heptane combustion", Combust. Flame, 155 (3), 380 (2008). Balagurunathan, J. Investigation of ignition delay times of conventional (Jp-8) and synthetic (S-8) jet fuels: A shock tube study, MSc Thesis, University of Dayton, Dayton (2011). Petersen, E. L. Davidson, D. F. and Hanson, R. K., "Ignition delay times of ram accelerator CH4/O2/diluent mixtures", J. Propul. Power, 15 (1), 82 (1999). Petersen, E. L. Davidson, D. F. Rohrig, M. and Hanson, R. K., "Shock-induced ignition of high-pressure H2-O2-Ar and CH4-O2-Ar mixtures", Proceeding of The 31st Joint Propulsion Conference and Exhibit, AIAA paper, San Diego, California, United States, pp. 1-10 (1995). Grillo, A. and Slack, M. W., "Shock tube study of ignition delay times in methane-oxygen-nitrogen-argon mixtures", Combust. Flame, 27, 377 (1976). Burcat, A. Farmer, R. F. and Matula, R. A., "Shock initiated ignition in heptane-oxygen-argon mixtures", Proceedings of The 13th Int. Symp. on Shock Tubes and Waves, Niagara Falls, USA, 13, pp. 826–833 (1981). Olchanski, E. and Burcat, A., "Decane oxidation in a shock tube", Int. J. Chem. Kinet., 38 (12), 703 (2006). Jinhu, L. Su, W. Honghao, H. Shengtao, Zh. Bingcheng, F. and Jiping, C., "Shock tube study of kerosene ignition delay at high pressures", Phys. Mech. Astron., 55 (6), 947 (2012). Vasu, S. S., Measurements of ignition times, OH time-histories, and reaction rates in jet fuel and surrogate oxidation systems, PhD Thesis, Stanford University, California, United States, (2010). Edwards, T., "Liquid fuels and propellants for aerospace propulsion", J. Propul. Power, 19 (6), 1089 (2003). Violi, A. Yan, S. Eddings, E. G. Sarofim, A. F. Granata, S. Faravelli, T. and Ranzi, E., "Experimental formulation and kinetic model for JP-8 surrogate mixtures", Combust. Sci. Technol., 174 (11), 399 (2002). Edwards, T. and Maurice, L. Q., "Surrogate mixtures to represent complex aviation and rocket fuels", J. Propul. Power, 17 (2), 461 (2001). Gueret, C. Cathonnet, M. Boettner, J. C. and Gaillard, F., "Experimental study and modeling of kerosene oxidation in a jet-stirred flow reactor", Proc. Combust. Inst., 23, 211 (1990). Dean, A. J. Penyazkov, O. G. Sevruk, K. L. and Varatharajan, B., "Ignition of aviation kerosene at high temperatures", Proceeding of The 20th Int. Coll. on the Dynamics of Explosions and Reactive Systems (ICDERS), Montreal, Canada, 31, pp. 1-4 (2005). Zhukov, V. P. Sechenov, V. A. and Starikovskiy, A. Y., "Autoignition of kerosene (Jet-A)/air mixtures behind reflected shock waves", Fuel, 126, 169 (2014). Saxena, S. Kahandawala, M. S. P. and Sidhu, S. S., "A shock tube study of ignition delay in the combustion of ethylene", Combust. Flame, 158 (6), 1019 (2011). Baker, J. A. and Skinner, G. B., "Shock-tube studies on the ignition of ethylene-oxygen-argon mixtures", Flame, 19, 347 (1972). Hidaka, Y. Kataoka, T. and Suga, M., "A shock-tube investigation of ignition in ethylene–oxygen–argon mixtures", Bull. Chem. Soc. Jpn., 47 (9), 2166 (1974). Kalitan, D. M. Hall, J. M. and Petersen, E. L., "Ignition and oxidation of ethylene-oxygen-diluent mixtures with and without silane", J. Propul. Power, 21 (6), 1045 (2005). Zhukov, V. P. Sechenov, V. A. and Starikovskii, A. Y., "Spontaneous ignition of methane-air mixtures in a wide range of pressures", Combust. Explos. Shock. Waves, 39 (5), 487 (2003). Zhukov, V. P. Sechenov, V. A. and Starikovskii, A. Y., "Autoignition of n-decane at high pressure", Combust. Flame, 153 (1), 130 (2008). Zhukov, V. P. Sechenov, V. A. and Starikovskiy, A. Y., "Ignition delay times of kerosene (Jet-A)/air mixtures", Proceeding of The 31st Symposium on Combustion, Heidelberg, Germany, pp. 1-15 (2006). Brown, C. J. and Thomas, G. O., "Experimental studies of shock-induced ignition and transition to detonation in ethylene and propane mixtures", Combust. Flame, 117 (4), 861 (1999).